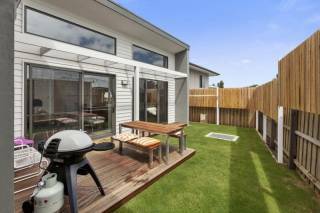 Reap the glorious afternoon sun in this stunning new 3 bedroom townhouse, which is only metres from the Barwon River, Golf Course and Blue Waters Lake. Luxury modern decor, leather lounge. Desk area with built in WIFI access points. WIFI access. - Pay TV channels - 4 LCD TV's (1 in each living room, 1 in mobility friendly bedroom, 1 in an upstairs bedroom) - Air Conditioning upstairs and downstairs - Fully self contained kitchen with dishwasher & freezer - Landscaped gardens, step free deck area - Fully self contained laundry with dryer - Accessible parking spaces outside townhouse (garage parking) - Level and ramped access into property. Ground level accessible wet area bathroom - Wide doors in downstairs area - main door, bedroom door and bathroom door, sliding deck doors - Accessible holiday rental - promoting inclusive travel for all. The ground floor consists of open living spaces overlooking a north courtyard. The fully self contained kitchen is equipped with quality Bosch appliances, a coffee machine and all usual amenities. Downstairs: There is one bedroom downstairs, which has a TV and DVD player and roll in wet room en suite. This bedroom has a king bed that can be prepared as two single beds. The living room overlooks a private north al fresco area with extra wide doors, complete with a Bora Bora Daybed for two and with retracting shutters for shade and privacy. A 2nd toilet, wash room and laundry complete the downstairs area. 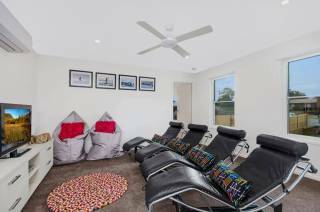 Upstairs: Consists of a 2nd lounge room with comfy couches and low chair bean bags, The 2nd bedroom has one split queen bed (which converts to 2 single beds) and a single bed. Another TV and DVD player complements the bedroom and is hidden in the wardrobe for those who do not want to use it. The 3rd bedroom has a queen size bed with luxury latex mattress. A 3rd toilet, and 2nd bathroom complete the upstairs area. Mobility Accessible Features: - Accessible parking outside the townhouse inside the garage - Wide doors to entrance of property, downstairs bedroom, downstairs bathroom and deck - Level access through front door, or ramped access via garage entrance to property - Entrance level roll in bathroom - Step free access to living area, kitchen, deck, bedroom, bathroom - Split king bed (that can convert to 2 singles), is a high bed with ample under bed height to cater a transfer hoist, TV and DVD play in the bedroom. Bookings between 20 December - 30 January - 25% is due at the time of booking. Balance is due on 10th December. All other times - 25% is due at the time of booking. Balance within 2 weeks of arrival. 3) Australian long weekend periods have a minimum stay period of up to 4 nights. January bookings have varied check in and out times. Refer to your confirmation email. 5) Food and drink is not permitted on carpeted areas. 6) SMOKING: All homes are smoke free. Please adhere to this policy to ensure properties remain fresh and unstained. It is also a precaution against fire. Smokers are welcome to indulge outside, but please dispose of cigarette butts responsibly. If you decide to smoke inside a charge may be applicable to you to allow the premises to be aired for 24 hours. 7) VALUABLES: Valuables are not well protected by insurance policies in accommodation facilities in Australia. Property owners shall not accept responsibility for loss or damage to guests’ property. 8) COMPLAINTS: Please make contact at the first available opportunity during your stay. We will then rectify/resolve the issue in a timely fashion so that you can go on to enjoy your stay. CLEANERS may from time to time miss something, but if we don’t know about it, we cannot fix it. It is our aim to make sure that you, our guest, is happy. Complaints after the date of departure will be noted and acted on where appropriate but we will not enter into tariff negotiations/compensation as you have not provided us with an opportunity to fix the issue during your stay. If you call us out during your stay we will rectify any issues as soon as practicable. A callout fee of $25 may be charged should you call us out to replace or fix items that are not actually faulty. 9) Your reservation price is protected. If the tariff varies after this reservation is accepted, you will only be charged at the reservation price. 10) Pets are not permitted at any homes other than those in our pet friendly range. 11) LARGE GATHERINGS: No person on the premises shall be guilty of conduct that is a nuisance to adjoining or neighbouring occupiers. In units, by-laws must be adhered to. No weddings, parties or large gatherings are permitted in any of the homes. You must vacate the property immediately and without refund should this condition not be complied with. Schoolies are charged at peak tariff rates at all properties. 12) In the event of a property being offered for sale, the renter agrees to allow the owner or his agent to inspect the property with prospective purchasers during reasonable hours at a suitable time to the renter. 13) The Agent reserves the right to apply an extra bond on holiday premises if considered necessary. 14) The Agent will not be responsible for alternative accommodation or any other costs when guests arrive after hours. 15) The Agent and property owners will not be responsible for any inconvenience for the purpose of building or sewerage works, or any works instigated by the Body Corporate of a unit complex. 16) BELONGINGS LEFT AT A HOME UPON DEPARTURE: Please email us and we will then email you a postage form to complete, together with postage payment, so that the item can be returned to you safely. The Agent is not liable for postage costs. Alternatively, the item can be posted COD, or you may elect to post a self-addressed and stamped satchel to PO Box 1191 Barwon Heads together with your details, so that the item can be returned. 18) Childrens Facilities We ask that you wipe down the toys after use so they are fresh for the following guests. Cleaning products are left at most homes. 19) Bookings are made in good faith by The Agent as booking agent, but no warranty is given, or representation made, that no unanticipated later change in the circumstances of the property can frustrate the booking (for example, the property may possibly be damaged or sold). The Agent does not accept responsibility for such circumstances but will use best endeavours to provide suitable alternative accommodation should the property be rendered unavailable for the booking. It is the sole responsibility of the registered owner of each property to keep homes properly maintained before during and after occupancy. 21) A renter who stays for longer than the agreed booked period as stated in the confirmation email will be evicted. Guests who fail to remit the agreed tariff as stated in the confirmation of bookings will be either refused entry to the property, or in the case of ongoing payment plan bookings, will be evicted immediately. A $150 cancellation charge may be applicable to all bookings. All cancelled bookings made through 3rd party sites such as Aura and Stayz will incur a non-refundable 8% cancellation fee of total booking amount plus up to $150 cancellation fee. 23) Refunds - You should expect to receive your refund within five (5) business days of written notification of the cancellation, in many cases you will receive a refund immediately. Bank transfers routinely take 1-2 days to process electronic transfers. We'll notify you via e-mail of your refund. 24) Gift Vouchers - We do not offer a refund but will do our best to work with you on extension of time for gift vouchers. 25) Processing Fees - Our processing charges are intended to compensate our company for the cost of processing your order. We encourage you to also review detailed information about our processing fees which are as follows: all credit card transactions will incur a 2% surcharge, (AMEX 3%). All credit card transactions made through our online secure payment facility on this web site will incur a one off booking fee (usually $3.95). Internet banking payments made through our website or individually do not incur any processing fees. 26) User Comments - We welcome your comments about our Web Site. However, any comments, feedback, notes, messages, ideas, suggestions or other communications (collectively "comments") sent to our Web Site shall be and remain the exclusive property of Ocean Grove & Barwon Heads Stays. Your submission of any such Comments shall constitute an assignment to Ocean Grove & Barwon Heads Stays and its Brands of all worldwide rights, titles and interests in all copyrights and other intellectual property rights in the Comments. Ocean Grove & Barwon Heads Stays will be entitled to use, reproduce, disclose, publish and distribute any material you submit for any purpose whatsoever, without restriction and without compensating you in any way. For this reason, we ask that you not send us any comments that you do not wish to assign to us, including any confidential information or any original creative materials such as stories, product ideas, computer code or original artwork. 27) Disclaimer - This Web Site and all Content available on this Web Site are provided on an "as is" basis without warranties of any kind, either express or implied, including without limitation warranties of title or implied warranties of merchantability or fitness for a particular purpose. You acknowledge, by your use of this Web Site, that your use of this Web Site is at your sole risk, that you assume full responsibility for all costs associated with all necessary servicing or repairs of any equipment you use in connection with your use of this Web Site, and that Ocean Grove & Barwon Heads Stays shall not be liable for any damages of any kind related to your use of this Web Site. 28) Properties Information - Properties displayed on our Web Site are available according to the availability calendar on this web site. In some cases, properties displayed as available on our Web Site may not be available after booking for a variety of reasons. We will notify you as soon as practicable if a situation arises whereby your chosen property becomes unavailable and work with you to secure another property. The prices displayed on our Web Site are quoted in Australian Dollars and are valid and effective only in Australia. Rates may vary at any time without notice. 29) Inaccuracy Disclaimer - From time to time there may be information on our Web Site that contains typographical errors, inaccuracies, or omissions that may relate to product descriptions, pricing, and availability. Ocean Grove & Barwon Heads Stays reserves the right to correct any errors, inaccuracies or omissions and to change or update information at any time without prior notice (including after you have submitted your order). 31) Collecting Information About You - There may be times (such as when you book a property, subscribe to a service, register to receive catalogs, or to participate in contests, sweepstakes or promotions, etc.) when we ask you to provide certain information about yourself, such as your name, shipping/billing address, telephone number, email address, credit card information, birth date, gender, occupation, personal interests, etc. We may also maintain a record of your product purchases. Whether or not to provide such information is completely your own choice. But if you choose not to provide the information we request, you may be unable to purchase products, or access certain services, offers and content on our web site. In addition, we may need to contact you via phone, email or mail to address questions or issues specific to your order, entry, etc., even if you have opted to not receive communications from us. In general, you can visit many of our web pages without telling us who you are or revealing any personal information about yourself. We may track the Internet domain address from which people visit us and analyze this data for trends and statistics, but individual users will remain anonymous, unless you voluntarily tell us who you are. 32) Using Information About You - We use the personal information you provide for internal purposes, such as confirming and tracking your order, subscription or registration, analyzing trends and statistics, informing you of our new properties, services and offers, and providing you with information from and about Ocean Grove & Barwon Heads Stays. We want to communicate with you only if you want to hear from us. If you prefer not to receive information from us please let us know by calling us at 0403 515605, or by sending us an email. Please be sure to include your email address, mailing address, full name, and specifically what information you do not want to receive. If you would like to update or correct your email address, mailing address or other personal information with us please contact us the same way. Please note that any requests to remove or update your personal information may take up to ten days for your email request and 6–8 weeks to process your postal mail request. 33) Protecting Children - Ocean Grove & Barwon Heads Stays take special care to protect the safety and privacy of children. Our web sites are general audience sites. 34) Security - We take precautions, including use of sophisticated encryption and authentication tools, to protect the security of your personal information that you share with us. Unfortunately, however, no data transmission over the Internet can be guaranteed to be 100% secure. As a result, while we strive to protect your personal information, we cannot guarantee or warrant the security of any information you transmit to or from our web sites, and you do so at your own risk. Also remember to log off and close your browser window when you have finished your visit. This is to ensure that others cannot access your account, especially if you are sharing a computer with someone else or are using a computer in a public place such as a library or Internet cafe. 36) SHOOLIES BOOKINGS: All schoolies bookings are charged at Peak Rates. Some homes do not allow schoolies so you must check with us by email before booking any homes. 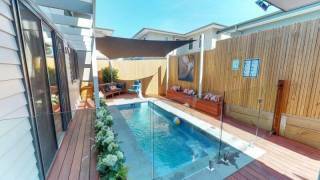 Schoolies bookings have special conditions that also need to be discussed prior to bookings being taken. Please refer to the bond section of this site for further information. How do I join your VIP list? A. Yes. A $300 per booking bond is payable, and is returned to you within 14 days of departure so long as the property is left in a neat, clean and undamaged state, and all check in and out times have been adhered to. At the completion of your booking, you must email/write to us with your preferred method to receive your bond. So long as they house is left in a neat, clean and undamaged state, your bond monies will be refunded. A. Several homes allow schoolies. Special conditions apply and you should email us directly to discuss. Can I get a babysitter? A. Yes. Please give us as much notice as possible and we will put you in touch with a babysitter. This service is offered client-babysitter direct. Can I get an in house massage? A. Yes. Please let us know and we will provide phone numbers to local massage therapists that provide this service. Can I get a house at a cheaper rate than advertised? A. We offer deals and packages for the homes, and most can be found on the 'promos' tab on the home site of this website. You should also contact us direct at enquiries@oceangrovestays.com.au in case of last minute rates and deals. If a house is running a special deal that you have booked, those bookings do not include bath robes, slippers, toiletries and condiments. I have a complaint to make, what is your policy? If you wish to lodge a complaint please make contact at the first available opportunity during your stay. We will then rectify/resolve the issue in a timely fashion so that you can go on to enjoy your stay. CLEANERS may from time to time miss something, but if we don’t know about it, we cannot fix it. It is our aim to make sure that you, our guest, is happy. Complaints after the date of departure will be noted and acted on where appropriate but we will not enter into tariff negotiations. Do you allow large gatherings at your properties? No person on the premises shall be guilty of conduct that is a nuisance to adjoining or neighbouring occupiers. In units, by-laws must be adhered to. No weddings, parties or large gatherings are permitted in any of the homes. 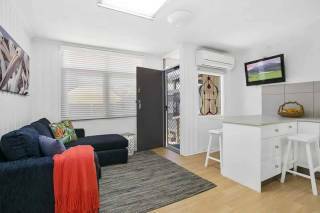 Schoolies are charged at peak tariff rates at all properties. 30. Disclaimer - This website and all content available on this website are provided on an "as is" basis without warranties of any kind, either express or implied, including without limitation warranties of title or implied warranties of merchantability or fitness for a particular purpose. You acknowledge, by your use of this website, that your use of this website is at your sole risk, and that Great Ocean Air shall not be liable for any damages of any kind related to your use of this website. 31. Inaccuracy Disclaimer - From time to time there may be information on our website that contains typographical errors, inaccuracies, or omissions that may relate to product descriptions, pricing, and availability. Great Ocean Air reserves the right to correct any errors, inaccuracies or omissions and to change or update information at any time without prior notice (including after you have submitted your booking). 33. Collecting Information About You - There may be times (such as when you book a service, subscribe to a service, register to participate in contests or promotions, etc.) when we ask you to provide certain information about yourself, such as your name, shipping/billing address, telephone number, email address, credit card information, birth date, gender, occupation, personal interests, etc. We may also maintain a record of your product purchases. 34. In general, you can visit many of our web pages without telling us who you are or revealing any personal information about yourself. We may track the Internet domain address from which people visit us and analyze this data for trends and statistics, but individual users will remain anonymous, unless you voluntarily tell us who you are. 35. Using Information About You - We use the personal information you provide for internal purposes, such as confirming and tracking your order, subscription or registration, analyzing trends and statistics, informing you of our new properties, services and offers, and providing you with information from and about Great Ocean Air. We want to communicate with you only if you want to hear from us. If you prefer not to receive information from us please let us know by emailing us at jeff@greatoceanair.com.au or chris@greatoceanair.com.au Please be sure to include your email address, mailing address, full name, and specifically what information you do not want to receive. If you would like to update or correct your email address, mailing address or other personal information with us please contact us the same way. Please note that any requests to remove or update your personal information may take up to three days for your email request and 2-3 weeks to process your postal mail request. 36. Protecting Children – Great Ocean Air take special care to protect the safety and privacy of children. Our web sites are general audience sites. 37. Security - We take precautions, including use of sophisticated encryption and authentication tools, to protect the security of your personal information that you share with us. Unfortunately, however, no data transmission over the Internet can be guaranteed to be 100% secure. As a result, while we strive to protect your personal information, we cannot guarantee or warrant the security of any information you transmit to or from our web sites, and you do so at your own risk. Also remember to log off and close your browser window when you have finished your visit. This is to ensure that others cannot access your account, especially if you are sharing a computer with someone else or are using a computer in a public place such as a library or Internet cafe.